PCP Terms and Conditions: New retail NC750 Integra orders before 31/07/19. Subject to model and colour availability. Offers applicable at participating dealers and are at the promoter's absolute discretion (excluding Channel Islands). Representative example based on 3 years 6.9% PCP. Excess mileage rate applies. Final payment includes £10 option to purchase fee. You do not have to pay the Final Payment if you return the bike at the end of the agreement and you have paid all other amounts due, the bike is in good condition and has been serviced in accordance with the Honda service book and the maximum annual mileage of 4,000 has not been exceeded. Excess mileage rate applies should this be exceeded. Indemnities may be required in certain circumstances. Finance is only available to persons aged 18 or over, subject to status. All figures are correct at time of publication but may be subject to change. Honda Franchise Dealers are credit brokers, not lenders. Credit provided by Honda Finance Europe Plc. Cain Road, Bracknell, Berkshire RG12 1HL. Honda Financial Services is a trading name of Honda Finance Europe Plc. a company registered at Companies House No 03289418. Honda Finance Europe plc is authorised and regulated by the Financial Conduct Authority, Financial Services Register number 312541. 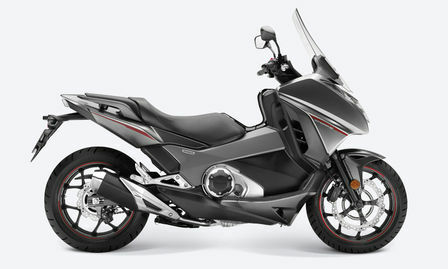 The Integra – launched in 2012 as one of three models in Honda’s New Concept (NC) platform – takes its name from the fact that it integrates the comfort and style of a scooter with the dynamic performance of a motorcycle. Equipped as standard with Honda’s Dual Clutch Transmission (DCT), for 2014 its torque, fuel-efficient twin-cylinder engine was increased in capacity to 745cc. Sharper styling, improved ergonomics and handling complemented the extra power and performance. This next stage in its development sees the 2016 Integra receive upgrades that boost its looks, practicality and riding experience, further polishing one of the most individual two-wheeled machines in the Honda range. A spring preload adjuster is added to the rear shock absorber while new Showa Dual Bending Valves (SDBV) front forks are fitted up front. The new exhaust muffler saves weight and is tuned to generate a pleasing exhaust ‘pulse’ note. For the two SE paint options Honda has used its new metal-look finish for the first time. This special paint uses brilliant flakes aligned in parallel with each other and differs to standard metallic paint in creating a solid texture with high contrast, offering varying impressions depending on the viewing angle. The SE also have extra accent stripes, wheel rim stripes and a different engine cover finish. The DCT used by the Integra now features “Adaptive Clutch Capability Control” that manages the amount of clutch torque transmitted. This adds a natural ‘feathered’ clutch feel when opening or shutting off the throttle for a smoother ride. Further refinements include faster operation of the N-D switch on turning on the ignition and a control system in AT mode for gauging the angle of ascent or descent and adapting shift pattern accordingly. 41mm telescopic forks feature 120mm travel and for 2016 use Showa Dual Bending Valves, with ratios optimised for both compression and rebound damping. This allows the generation of damping force in proportion to piston speed – from the low speed range – improving ride quality and comfort. Increased compression damping provides more progressive firmer suspension response and helps reduce dive under heavy braking. Grey Alumite caps add a finishing touch. The rear monoshock gains a spring preload adjuster and also has 120mm travel. It operates through an aluminium swingarm with Pro-Link that offers an optimised balance of a soft initial stroke, for dealing with low-speed bumps, and excellent overall control. Cast aluminium front and rear wheels – sizes 17 x 3.50-inch and 17 x 4.50-inch – wear 120/70 ZR17 and 160/60 ZR17 tyres. Alongside the frame and suspension they inject the Integra with ‘proper’ motorcycle handling and feel, very much one of its unique selling points. New forged aluminium L-shaped rim valves make checking and adjusting air pressure easier. The design of the Integra’s liquid-cooled, SOHC 8-valve parallel twin-cylinder engine ensures punchy performance in the low-to-mid range. Its relatively long-stroke architecture and specially shaped combustion chambers combine with the high-inertial mass crankshaft to produce large amounts of effortless torque from very low rpm. Peak power is 40.3kW @ 6,250rpm with maximum torque of 68Nm @ 4,750rpm. Twin balancers counteract vibration from higher rpm inertia, refining the engine yet still allowing the distinct ‘throb’ delivered by its 270° firing order. Bore and stroke is set at 80 x 77mm. By keeping the number of parts to a minimum, the engine is kept light, efficient and reliable.